The idea of pop-up shopping has been around for a while. Think seasonal Christmas tree stands on vacant lots, fireworks or Halloween costume stores in unfilled mall locations. Think even, the street markets, souks or bazaars of ancient times. Pop-up, or flash retailing, is about taking the store to where the customers are, gaining their attention with some eye-catching display techniques and building on that interest with a limited time proposition. The pop-up has been steadily going mainstream and is now being used by everyone from Target and Costco to Kate Spade and Louis Vuitton. 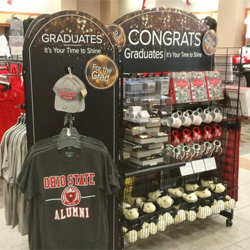 A graduation pop-up in the Barnes & Noble at The Ohio State University bookstore, filled with specially curated gift ideas for ‘Buckeye’ graduates. One of the advantages of pop-up is that it’s truly versatile ─ used for anything from product testing to new store openings ─ with the advantage of a flexible, temporary approach that can deliver the kind of big impact retailers and brands are looking for. Davis works with clients on pop-up installations that can last anywhere from one day or three months or a year, and they don’t have to be physically contained in the four walls of the retailer. 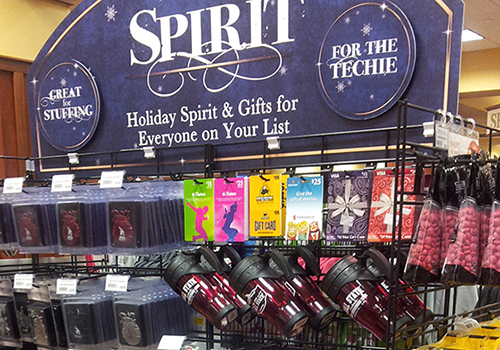 Medallion has designed pop-ups for Barnes & Noble College at sporting events, where school pride gear, souvenirs and mascots can be made available at the game, rather than back at the home store. “You’re simplifying the process for the customer, curating the best of the best and putting it into a pop-up shop that can be themed for graduation, homecoming or any specific key selling times when the customer is focused on that event,” Davis says. In the next three to five years, some 75 percent of retailers will likely be implementing pop-up retailing in some shape or form, creating an $80 billion dollar industry. Davis doesn’t see this as an isolated merchandising idea, but an integral part of the marketing mix. “It has great application to be marketed through social media channels for example, and Barnes & Noble College is definitely a leader when it comes to marketing, educating and engaging their students across many different channels,” she says, noting that college students are the perfect demographic to engage with this kind of inter-active retailing.